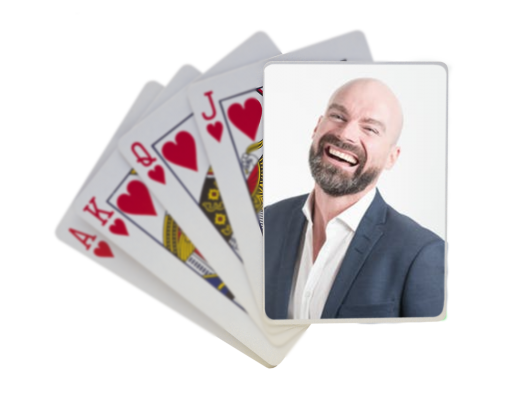 Can you print your photo on all 52 cards in a standard 52-card deck? Enjoying the blogs? If so, do like and follow us on Facebook and Instagram. Today I am sharing a product which is evergreen for your friends and family as a gift for their Anniversaries, Birthdays, Festivals or any other occasions. The readers might have a pictorial idea of the product. Yes you have thought of the product exactly. It is Customizable Photo Printed Playing Cards. As the name suggests, your picture is printed at the back of each and every playing card. Yes, you have read it right, all 52 cards can be customized at once with either your image or design or text. You can place any photo on the Playing card and we will print it for you. Sounds Amazing, doesn’t it? According to the your requirements, the product “Customized Playing Cards” can be customized, personalized, designed and photo printed in High Definition Printing Quality. You can place your own image on the back of each and every card in the deck of cards. These Customized Playing Cards are made of highly durable, flexible plastic which in turn gives a sophisticated look to the Personalized Playing Cards. The cards are waterproof and tear proof unless any undue force is applied on them. Below, we have detailed how you can get your own set of playing cards. You can design it in seconds from the comfort of your homes, right from your smartphone screens. Once designed, we will print the cards exactly as per your designs. These selfie cards are the perfect gift for all occasions – Birthdays, Festivals like Diwali, Holi, Christmas, Wedding Anniversaries etc. Step 2: Select your preferred layout for custom playing cards on the category page. 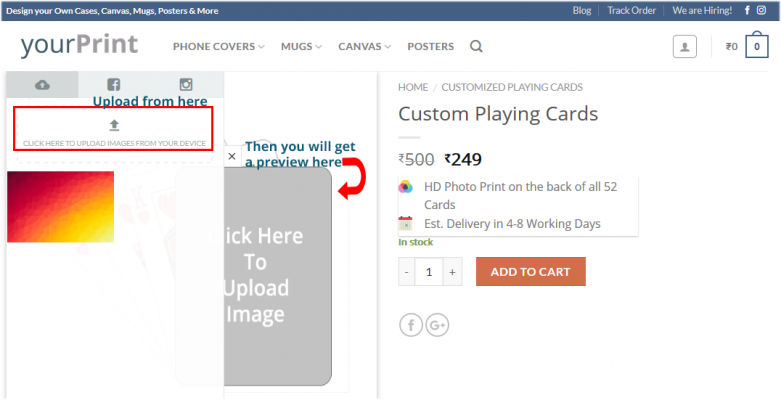 Step 3: Once on the product page, Upload your selected Image for customization of the card. Step 5: Fill in your details on the checkout page and place the order. Sir. Mera order. Out of date h. Or aapke customer care ke number bhi Nhi h bta skte h kab tk milega order hme. Can you get me a deck with personalised photo on one side and blank card on the other side of all the 52 cards. Plz add Brand honor 8lite phone. I am not get my mobile back cover my oder no.is 69629819755. One and half months ago I ordered this. Online payment is done. Is this a cheet company ? I have received my back cover before the promising day. I am totally satisfied with the product and their customer service.